Recently I've been slightly obsessed with nail varnish. Even though I already own a load I can't help lusting over more and have added several to my collection recently, although I've only added cheaper brands such as Barry M and Models Own. I am a big fan of some higher end brands of nail varnish, but I only really tend to buy them when they're on some kind of offer, so a little more reasonably priced. I think 2015 is going to be a big year for nails on my blog as I'm itching to try so many nail art designs and as it's sale time I though I'd do a little round up of some of the best nail varnish bargains I've found in the Boxing day sales. I apologise if any of these offers have sold out by the time you've read this post! OPI is one of my favourite nail varnish brands and I've added a couple of their varnishes to my stash recently. Two of their most recent collaborations are with Coca Cola and Gwen Stefani and both ranges have some lovely shades. A few shades from each collection are reduced over on ASOS for £7/£8. I picked up I carol about you from the Gwen Stefani range for £8. The Rollin in cashmere collection is now just £20.96 from Debenhams and contains a gold base shade (Rollin in cashmere), a snow effect topper (Snow globetrotter) and a dark glitter topper (Comet in the sky). 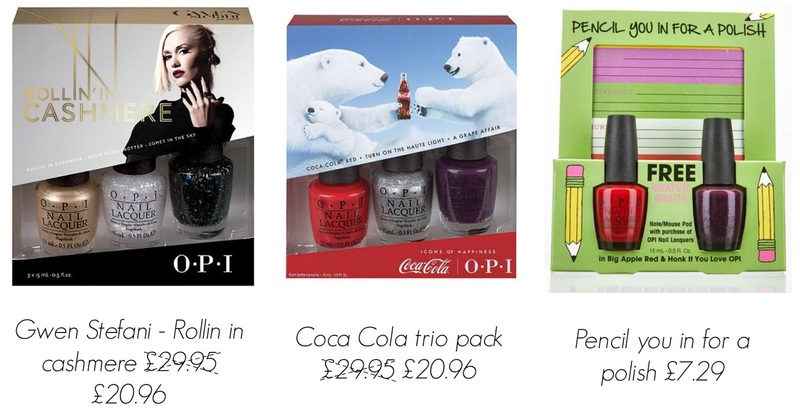 The Coca Cola trio pack is also now just £20.96 from Debenhams and contains a red (Coa Cola red), silver (Turn on the haute light) and purple (A grape affair). I haven't actually seen the Pencil you in for a polish set before but you get two full size nail varnishes and a free note pad for £7.20 from Look Fantastic. As full size OPI shades are at least £11.95 each this is a bit of a bargain. It's also worth noting that some single OPI shades are reduced down to as little as £3.99 on Look Fantastic. I've mentioned before that I love Nails Inc's new shape bottles, but I wasn't so keen on was the price hike to accompany their new look. You can now expect to pay around £14/£15 for a Nails Inc shade in a new bottle. Nails Inc have some lovely gift sets featuring their new bottles that already offered a discount compared to buying them separately and now some of them are available in the sale. The Winter wonderland collection is now £20.30 from Debenhams and contains three seasonally appropriate shades, Trafalgar Square (red glitter), St George's Square (white and silver glitter) and Buckingham Square (rose gold glitter). The Nails Inc Be Gelous collection contains six gel affect nail varnishes in a range of shades (including a glitter) and is now just £29.40 from Debenhams. I know the postage charge (£4.95!) from Selfridges is rather off putting, especially when it comes to sale purchases, but even adding the delivery charge the Nails Inc Message in a manicure set is still quite a bargain at £20 down from £45. This includes 18 mini shades in a good range of colours and effects (including a top coat) and 150 letters/characters to personalise your manicure. You can grab an exclusive to ASOS Ciate tree trinket for £5 reduced from £8. I know £5 is not that cheap for a mini nail varnish but it's a gorgeous glitter that you can only get from ASOS so I think it's worth adding it to your order if you're making one. I've never really considered trying a Deborah Lippmann varnish before as I believe they comes in at £18 each, but the Steal my kisses set caught my eye as it's less than half price from Look Fantastic at just £12.09. They are only mini shades rather than full size, but this is still a bargain and they're actually magnetic varnishes so you can create a pretty effect with the included magnet. I might just be adding this to my basket so I can try Deborah Lippmann for a very reasonable price. Last but not least, although I've never heard of Azature before I've noticed that several shades of their Diamond nail varnish are reduced from £17 down to just £3 at Selfridges. 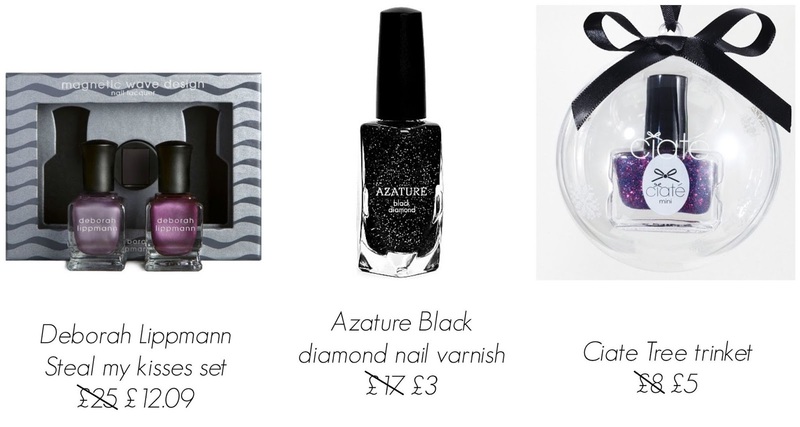 Azature Black diamond is apparently the most expensive polish in the world (as it contains real black diamonds) and this has been created as a more purse friendly option at a fraction of the price, so this really is a bargain. Over on Beauty bay there doesn't appear to be any nail varnish in the sale but they are offering 3 for 2 mix and match on Essie and OPI, so if you're willing to pay full price for a couple of shades or sets you will get the third one free. Finally if you'd still like to get your hands on any Christmas Ciate I'd recommend TK Maxx as before Christmas (they may be even cheaper now) the advent calender was around £25, the tree trinket set £15 and the Candy cane house £7. Have you treated yourself to any new nail varnish in the sales? Some great nail polishes here! That Azature one is such an incredible bargain and so beautiful!